Click here for 29 full quotes from Cory Booker in the book United, by Cory Booker. This book is Cory Booker's autobiography: his upbringing and rise to power as Mayor of Newark and then Senator from New Jersey. It provides Booker's definitive story of his own life as well as his political philosophy. Booker was not raised in urban Newark: he was raised in a nearby suburb and moved to the city for political purposes. Upon moving to a low-income housing unit, he was treated as a well-meaning if naive carpetbagger; many chapters detail his loss of his naivete and becoming accepted as a member of the community. The "carpetbagger" label took longer to shed: his political opponents pointed out that his initials "CB" could stand for "Carpet Bagger." Ultimately, Booker was elected mayor and was considered a great success. He reduced crime and drugs; he improved the city's schools and quality of life; and he used his success as a launching board for his Senate campaign. Booker has a "nuanced" stance on crime and drug issues. He clearly enunciates the tenets of "Black Lives Matter"-- the inherent problems of white police in majority non-white communities--and the economic pressure for selling drugs. But he clearly personally wants to fight crime and drugs--he set up a tent in the middle of a drug-dealer center to "disrupt" the drug trade--somewhat successfully. He also bodily intervened to prevent a Newark police officer from using excessive force against a black suspect. We try to capture in his excerpts his dichotomy between his crime-fighter tendencies and his empathy for his constituents. We review this book now because Booker is on Hillary Clinton's list of Vice Presidential possibilities. He has been in the Senate for less than three years--not a lot of federal experience--but can claim long-term executive experience as mayor for 7 years and for 4 years on the City Council before that. That is actually more experience than Barack Obama had when elected--and more than other prospects such as Julian Castro who has been in Obama's Cabinet for two years and served as mayor for 5 years prior to that. If Hillary chooses Booker, it would be because she wants to capitalize on Obama's massive popularity in the black community--which was expressed not only by 90% of blacks voting for Obama, but also by a larger black turnout than any previous election. Hillary, however, already enjoys overwhelming support in the black community, and can count on both Obama and Bill Clinton to rally black voters as much as in 2008 and 2012. Furthermore, the Democrats will win New Jersey without Booker--he does not bring with him a purple state. 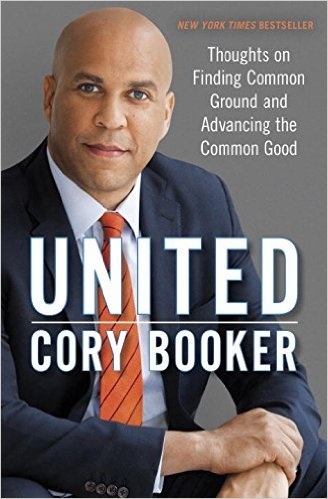 Nevertheless, Booker is a popular Senator and should end up on the short list in the Veepstakes--in which case this book will become required reading for all pundits. Blacks more likely to be suspended in school & jailed later. Creative civil rights activism revealed rampant injustice. Prison construction draws resources from other priorities. 1960s cities had mostly white cops & mostly black majority. Anti-recidivism funds much scanter than prison funds. Police doesn't solve problem; they just attend to symptoms. Reduced crime by helping prisoners coming home. Theory of "broken windows" doesn't drive down crime. Poor & minorities bear the brunt of policing practices. Parks and green spaces are associated with safer communities. Staged sit-in at urban housing to disrupt drug trade. Give addicts treatment instead of long sentences. Drug war isn't waged in privileged communities. Vegetarian since 1992; vegan since 2014. Passaic River poisoned because it was cheaper for business. Dumping pollutants into rivers externalizes costs. Trees reduce erosion & increase property values. Society struggles without paid family leave. Seek common ground to achieve transformative change. Declined lavish perks as Newark City Councilor. $1,000 reward for tip on illegal weapons. Raised in only black family in segregated neighborhood. After law school, worked with non-profits for city kids. Father raised in 1930s colored funeral home. Newark got disproportionate share of dumps & jails. Post-WWII policy of redlining forced racially-biased housing.